You can select the most common meta tags here. You can also define custom meta tags simply by entering the name of your meta tag without selecting an existing meta tag. Values for single language meta tags, such as "Robots=nofollow", can be entered here. With this option, values can be entered in each of the portal languages. Opens a dialog where the value can be entered in each of the portal languages. Multilingual values cannot be connected to global language constants. The meta tag will be generated in all Portal layouts with this option. The meta tag will only be generated in pages which have been transformed for mobile devices. 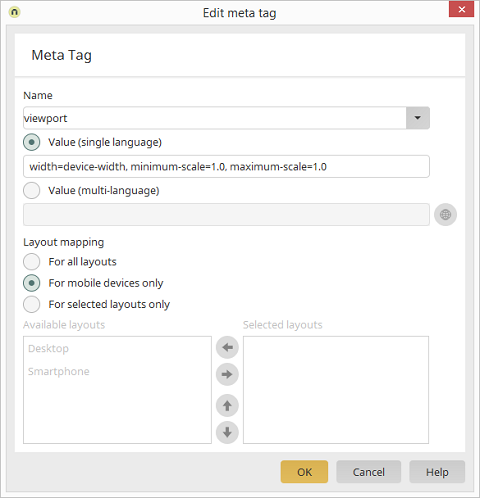 The meta tag can be released for individual layouts here. All layouts that can be selected are listed here. All layouts are listed here where the meta tag is entered. Move the currently selected layout from one list to the other. Modify the order of the layouts in the list.